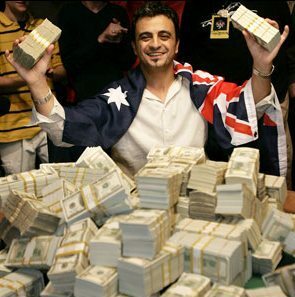 Joseph Hachem who was born in 1966 is a Lebanese-Australian poker player made famous by his victory at the no limit holdem main event of the 2005 World Series of Poker. Hachem was born in Lebanon, but his family moved to Australia in 1972. Hachem is a family man, married with four children. Joe Hachem used to be a chiropractor "down under", but a rare blood disorder prevented him to use his hands efficiently for his job. This was the perfect excuse to reconsider his profession and in 2002, he gave up his career and decided to become a full time poker professional. Joe Hachem played poker as a hobby for most of his adult life, but once he decided to turn pro, or rather semi-pro at the beginning, he played both live poker in Melbourne and online poker at PokerStars. As Joe's priority is and has always been his family, it was a tough choice for him to play at the WSOP in 2005, as Las Vegas is so far away from Melbourne. But he convinced himself that he should give a try to the ultimate poker player's dream. Great decision that he made. Joe Hachem won the $10,000 buy-in No-Limit Holdem main event at the 2005 WSOP, pocketing $7.5 million and prevailing over a field of 5,618 poker players. In order to prevail against such a crowd, one thing is absolutely necessary: avoiding tilt. By then these two numbers were both world records, but they have been surpassed since. Still, Joe has won one of the biggest poker prizes ever in poker history. Interestingly he won the last hand with total garbage, 73o, when he flopped a straight on a 654 board. Additionally, Joe Hachem has had nice money finishes at the WSOP, one title and three money finishes at the WPT and one money finish at the EPT. He has been closed to getting a second bracelet when he finished second at the $2,500 short-handed no limit event at the 2006 WSOP, when he was 3-outered by the river at the final hand. Joe Hachem is now a Team PokerStars member. This means that you may get a chance to play against him at pokerstars, in particular in some of the VIP promotions where the first prize is a heads-up match against Hachem. Joe Hachem has continued to demonstrate his poker skills in numerous other occasions. He is one of only five poker players (the other four are Doyle Brunson, Carlos Mortensen, Scotty Nguyen and Dan Harrington) to be both WSOP and WPT champions. Joe's total live tournament winnings are in excess of $10.7 million, making him the fifth poker player in live tournament career earnings.